Big hit or damp squib? How many of these is Apple selling? 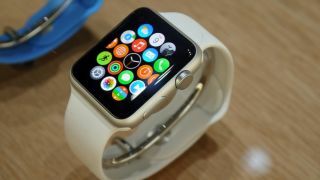 Apple hasn't released any official Apple Watch sales figures yet, but there are plenty of firms willing to take a punt on just how many wearable gadgets the Cupertino company is likely to shift over the first 12 months. First up is KGI Securities of Thailand - it reckons there's sluggish demand for the smart timepiece, dialling down its original predictions by 20-30% and estimating a total number of 15 million smartwatches sold in the first year. That's a lot more than Android Wear can muster, but would be a disappointment for Apple. KGI thinks that because Apple Watch shipping times are staying constant, demand has plateaued. The firm also reckons that four out of five Apple Watch orders placed have been for the larger 42mm model. That's all a bunch of baloney, say the analysts at Morgan Stanley (we would like to imagine). They're suggesting that demand for the Apple Watch has actually risen since it launched, and 36 million units will be sold over the first 12 months. And that's a conservative estimate apparently, based on the company's research. Morgan Stanley also believes that production problems with the Taptic Engine vibrators mean Apple isn't going to be able to capitalise on all the demand that's out there. We should know more in July when Apple announces its earnings for another quarter, though Apple Watch sales may not be mentioned specifically. So far company executives have hinted sales are going very well without mentioning exact figures.